Rufus Samuel Morgan was born March 15, 1920, on Main Street in Chattanooga, Tennessee. As a child he often played alone in the woods for hours on end. He has always had amazing abilities to tame wild animals, and his pets included a rescued baby owl, a crow, and a raccoon. He loved to draw on the long rolls of paper his dad brought home from work. In 1942, he joined the Army and served in Colorado Springs, Scotland and England, North Africa, Corsica, Italy and Southern France. In North Africa, he was trained to use the top-secret Segaba encoding machine. In Florence, Italy he took three drawing lessons from an elderly Italian lady in exchange for canned food. These were the only art lessons he ever took in his life. After the war he went to college on the GI Bill, graduating from the University of Tennessee at Chattanooga. He was third in his class at the UT Medical School in Memphis. In 1947 he married Elizabeth Boyett. They raised their two daughters, Julie and Connie, in Pikeville, Tennessee, in the beautiful Sequatchie Valley, where he practiced medicine for over 30 years. He drove the winding mountain roads on house calls almost every evening, and often happily took eggs and fresh vegetables as payment. In his spare time he was an avid hunter and fisherman, and spent many hours searching for Native American artifacts around Pikeville. He served several terms as Mayor of Pikeville and brought a shirt factory to town which provided many jobs. After his retirement from the Pikeville Clinic, he worked for several years at the emergency room at Memorial Hospital in Chattanooga until he retired from medicine in the nineties. After that, volunteered at the Lone Oak Clinic on Signal Mountain for many years. 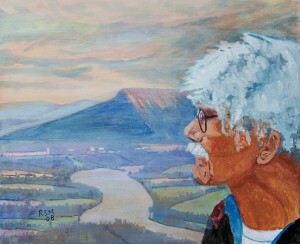 Dr. Morgan often painted through his years in Pikeville, but after his retirement he spent almost every day in his studio until 2009. His landscapes, most of them of his beloved Sequatchie Valley, reflect his lifetime as an outdoorsman, fisherman, and hunter. He often painted from memory or from photos he took in his drives through the countryside. In 2005, he had a one-man show at Perfect Light Gallery in Pikeville. He has also shown his work at the Renaissance Center in Kingston Springs, TN, at the AVA gallery in Chattanooga, and with Mountain Artists Guild on Signal Mountain. His paintings are in numerous collections in the United States, Japan, and China. Dr. Morgan passed away January 15, 2013 at the age of 92. On March 15, 2014 (what would have been Dr. Morgan’s 94th birthday), Mountain Education Foundation held a three-day sale of his paintings which netted MEF over $12,000, 100% of which went to benefit arts education in Signal Mountain Schools. This website continues to benefit MEF 100% with your purchases. All paintings are represented as true as possible. Please be aware that color and brightness may vary slightly depending on your monitor. Please feel free to inquire about the specifics of any painting in which you are interested. Sizes are listed on the individual paintings in the galleries. All paintings are $50. Please use the Contact form for any questions or to inquire about purchasing and shipping. 100% of all sales go to benefit Bledsoe County Schools, The Bledsoe Historical and Genealogical Society, The Ross House, and Mountain Education Foundation, which funds arts education in the Signal Mountain Schools.